His Holiness, Hazrat Mirza Masroor Ahmad (Mir-za Mas-roor Ah-mad), is the fifth Khalifa (Caliph) of the Ahmadiyya Muslim Community. Elected to this lifelong position on 22 April 2003, he serves as the worldwide spiritual and administrative head of an international religious organisation with tens of millions of members spread across more than 200 countries. His Holiness is the world’s leading Muslim figure promoting peace and inter-religious harmony. Through his sermons, lectures, books, and personal meetings, His Holiness has continuously advocated the worship of God Almighty and serving humanity. He also continuously advocates the establishment of universal human rights, a just society and separation of religion and state. Since being elected Khalifa, His Holiness has led a worldwide campaign to convey the peaceful message of Islam through all forms of print and digital media. Under his leadership, national branches of the Ahmadiyya Muslim Community have launched campaigns that reflect the true and peaceful teachings of Islam. Ahmadi Muslims the world over are engaged in grassroots efforts to distribute millions of ‘Peace’ leaflets to Muslims and non-Muslims alike, host interfaith and peace symposia, and present exhibitions of The Holy Qur’an to present its true and noble message. These campaigns have received worldwide media coverage and demonstrate that Islam champions peace, loyalty to one’s country of residence and service to humanity. In 2004, His Holiness launched the annual National Peace Symposium in which guests from all walks of life come together to exchange ideas on the promotion of peace and harmony. Every year, the symposium attracts many serving ministers, parliamentarians, politicians, religious leaders and other dignitaries. 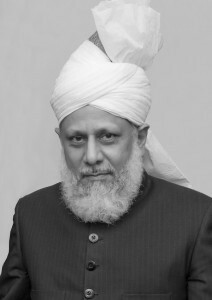 In 2009, His Holiness also launched the annual ‘Ahmadiyya Muslim Prize for the Advancement of Peace’: an international peace award for individuals or organisations that have demonstrated an extraordinary commitment and service to the cause of peace and humanitarianism. In 2012, both the United States Congress and the European Parliament benefited directly from His Holiness’s message of peace, justice and unity. On 27 June 2012, Hazrat Mirza Masroor Ahmad was welcomed to Capitol Hill in Washington D.C. where he delivered a keynote address entitled,‘The Path to Peace – Just Relations between Nations’, to an audience filled with more than 30 members of the United States Congress. In conjunction with this historic event, a bi-partisan resolution was introduced in the House of Representatives in honour of His Holiness’s visit. His Holiness receives thousands of letters every day from Ahmadi Muslims worldwide, seeking his guidance and prayers. As well as responding to all such letters, His Holiness meets with individual members of the Community, on a daily basis. Every week, His Holiness delivers a Friday Sermon in which he addresses all members of the Ahmadiyya Muslim Community worldwide. The sermon is broadcast globally live on MTA International, an Ahmadi Muslim satellite television station established in 1994, and translated into various languages. His Holiness uses his sermons to counsel Ahmadi Muslims about various issues of importance. Following his election in 2003, His Holiness was forced into exile from Pakistan, his native country. Pakistan’s Constitution and Penal Code restrict members of the Ahmadiyya Muslim Community from practising or associating with Islam, or from even identifying themselves as Muslims. Violations of these repressive laws result in fines, imprisonment, and potentially capital punishment. Consequently, the legislation prevents His Holiness from fulfilling his duties as Head of the Community and accordingly he is unable to return to Pakistan. Despite the continued sectarian persecution that Ahmadi Muslims are subjected to in various Muslim majority nations, His Holiness expressly forbids any violence. On 28 May 2010, anti-Ahmadiyya terrorists attacked two mosques belonging to the Ahmadiyya Muslim Community in Lahore, Pakistan. 86 Ahmadi Muslims were martyred during their Friday Prayers, whilst scores more were injured. Despite the barbaric nature of this pre-meditated crime against humanity, His Holiness instructed Ahmadi Muslims worldwide to respond only through prayers and entirely peaceful means. His Holiness was born on 15 September 1950 in Rabwah, Pakistan to the late Mirza Mansoor Ahmad and the late Nasira Begum Ahmad. Upon completing his Masters Degree in Agricultural Economics in 1977 from the Agriculture University in Faisalabad, Pakistan, His Holiness formally dedicated his life to the service of Islam. From 1977 to 1985, His Holiness served in Ghana, engaged in social, educational and agricultural development projects. He is accredited with successfully growing wheat on Ghanaian soil for the first time in the nation’s history. His Holiness returned to Pakistan in 1985 and served in various senior administrative posts within the Community during the next 18 years, including as Chief Executive of the Ahmadiyya Muslim Community in Pakistan from 1997 until his election as Khalifa. His Holiness resides in London, UK with his wife, Amtul Sabooh Ahmad. He has two children and three grandchildren. His hobbies include gardening, reading, photography and walking.